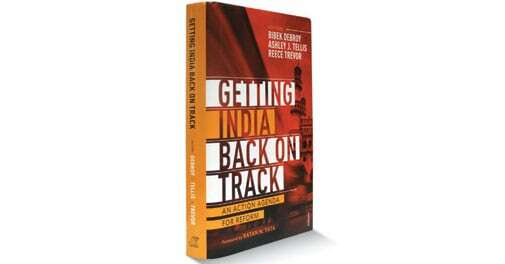 Leading minds offer insights into the problems facing the country and their possible solutions in 'Getting India Back on Track: An Action Agenda for Reform'. The Indian elephant has strayed from its growth path. The euphoria that lasted for several years after the economic reforms in 1991 has slowly died down. The elephant's once steady and sure-footed advance has given way to an uncertain wobble. Sagging growth and near-abandoned reforms for the past several years means a lot has to be fixed. So, what should the new government do? Getting India Back on Track lays out the challenges before the National Democratic Alliance government and possible ways of meeting them. The book doesn't limit itself to the economy. It provides insights from 22 top minds into the ills plaguing diverse areas of the Indian polity, such as foreign policy, defence, administrative reforms, environment, and discusses policy actions needed to get the country going again. While things could have been better, there is no cause for despair. If right steps are taken, the country can build on its existing foundation and acquire a stronger foothold on the world stage. As leading foreign policy analyst C. Raja Mohan says, while discussing the foreign policy agenda: "India today is a very different beast. As the world's 10th-largest economy (in real terms at the end of 2013) and the ninth-largest spender on defence, India has all the attributes of a major power in the making." He points out that a strong economy is a must even for better conduct of foreign policy. "The most important priority for the new government is undoubtedly the revival of India's economic growth. An emphasis on 'economy first' by the new government will have significant benefits in the conduct of foreign policy." So, what can be done to put the economy back on the high growth trajectory? A lot! "Until India reforms its fiscal, financial, and monetary policy frameworks, macroeconomic and financial uncertainty will only worsen," writes economist Ila Patnaik and currently Principal Economic Advisor in the Union Ministry of Finance. Manufacturing is in the doldrums. As economist Rajiv Kumar says: "In the absence of a well-conceived policy response (to the falling growth rate), it can be reasonably concluded that the manufacturing sector in India is either already in a major crisis or will soon descend into one." Kumar advocates easier entry and exit norms for companies. He points out that the average time taken for exiting a business, according to the World Bank's Doing Business survey, is at present a "horrendous" 10 years. According to Bibek Debroy, adding to the troubles is the slack administrative machinery. "Administrative deficit may not be talked about as much as fiscal and other deficits. But without it being corrected, growth and investments will not pick up." Environmental issues could lead to mass protests, feels TERI's Ligia Noronha. "The next big items on the electoral agenda after corruption will be environment quality, action on climate change and environmental justice. These issues are just waiting to spill on to the roads." The book is packed with information that could provide valuable inputs for policymaking. It could also be a ready reckoner for anyone who wants to study India's policy framework and know the status of the economy. The problems are evident to most, the solutions are not. And many problems and their solutions are very specific to this country. As Ashley J. Tellis says in another context: "However confusing that (the Indian) reality might be to the outside world, it is authentically and indisputably Indian."